Based in Boston, JAE is a Haitian contemporary dance company, directed by Jean Appolon. Combining Modern technique and Haitian folkloric dance, JAE brings a new artistic vernacular to its audiences. With its dynamic repertoire, JAE educates audiences about Haitian culture, traditions, history and current issues. JAE fulfills its mission to preserve Haitian folkloric culture while constantly enlivening the art form in a way that is vital, accessible, inspiring and educational. JAE is comprised of dancers from diverse backgrounds, each of whom who are committed to JAE’s mission to use dance to share Haitian culture. For more information or to book a performance, please click here. 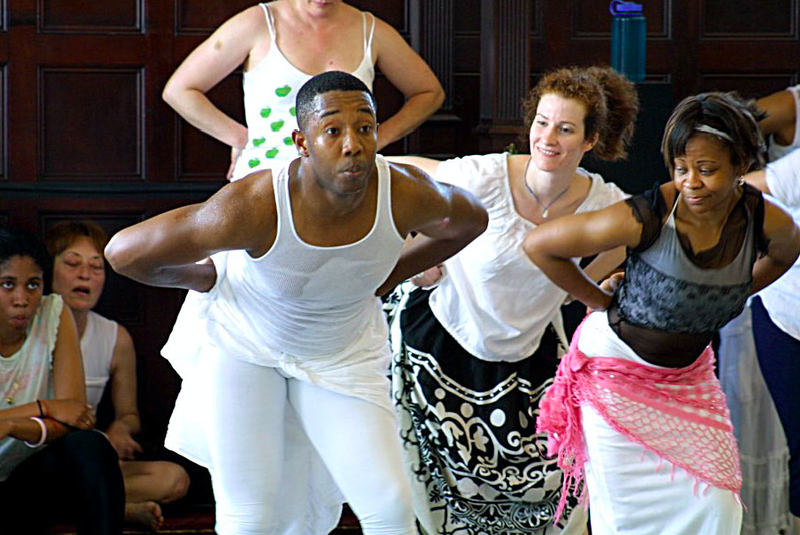 Appolon’s Boston-based Haitian contemporary dance company has performed both at major venues in Boston and beyond, and in city parks and community spaces in free performances accessible to the public. JAE also has performed at many colleges and universities, including Harvard University, Lesley College and Wheaton College. JAE has been fortunate to share the stage with celebrities such as Danny Glover, Henry Louis Gates and Edwidge Danticat, and to collaborate with community partners such as Inquilinos Boricuas en Acción (IBA) and Central Square Theater. Afro-Haitian dance has greatly influenced the Modern dance world, largely through the research and exposure of Modern dance icon Katherine Dunham. Haiti captured Dunham’s heart in the 1930s, when she arrived as a dancer and anthropologist to study the country’s culture, history and, particularly, its dance. Dunham, in turn, captured the hearts of Haitians by making the dances of Haiti and the Caribbean internationally known. Now, the “folklorization” of Haitian dance allows both religious and social dances to travel and be performed in the secular context of the proscenium stage. Jean Appolon Expressions is not strictly a Haitian Folkloric company, but rather seeks to preserve Haitian folkloric dance and music through contemporary interpretations. JAE has performed at the Boston Center for the Arts, the Institute for Contemporary Art, the Museum of Fine Arts, Harlem School of the Arts, numerous community festivals and several universities, just to name a few. LAKOU AYITI - Lakou Ayiti is an interdisciplinary production that meditates on the “lakou” and its loss in the Haitian imagination in a way that also speaks to a universal condition. Where can we find belonging? Where is home? Does it exist in the rhythms of Rara music and the undulating arms of Yanvalou? Learn more. ANGAJE - Angaje means "to engage" and is a meditation on different forms of social oppression, including violence against homosexuals - a growing problem in Haiti. Learn more. Anacaona - Anacoana is a story of strength and resilience of the different groups of people first brought to Haiti, inspired by the icon of early Haitian history. Ibo - The Haitian folkloric dance, Ibo, originated in the Igbo nation of Nigeria. Ibo expresses the pride of the Igbo people, who preferred death to enslavement. Ibo is especially relevant for Haitians who were the first enslaved people to stage a massive revolt, led by Toussaint Louverture in 1791. This slave rebellion resulted in Haiti being the first independent nation in Latin America and the Caribbean, and the first black republic in the world. The characteristic movement of this dance represents breaking the chains of slavery. Appolon’s Boston-based Haitian Contemporary dance company has performed at major venues in Boston and has toured to Washington, DC and Port-au-Prince, Haiti. JAE also has performed at many schools and colleges, including Harvard University, Lesley College and Wheaton College. JAE has been fortunate to share the stage with celebrities such as Danny Glover, Henry Louis Gates and Edwidge Danticat, and to collaborate with community partners such as Central Square Theater and Inquilinos Boricuas en Acción. Since 2012, Jean Appolon and JAE have received funding support fromThe W.K. Kellogg Foundation, The National Performance Network, FOKAL, The Boston Foundation, Massachusetts Cultural Council, Cambridge Cultural Council, Eastern Bank, Haiti’s Ministry of Culture and many individual donors. Appolon’s Boston-based company is one of the three inaugural dance companies to be part of the Boston Center for the Art’s expanded Performing Arts Residency Program. Appolon was a 2014 Dance Resident at Boston Center for the Arts and received the Green Street Studios New Works Program Award in 2013. Also in 2013, Appolon was nominated for a Brother Thomas Fellowship (awarded by The Boston Foundation), and honored by The Art of Black Dance and Music. Appolon has been the subject of feature articles and interviews in The Boston Globe, Dance Studio Life Magazine, World Vision Report, The Boston Haitian Reporter, Le Nouvelliste and NPR, and has received significant coverage by Haiti’s television and radio stations. Appolon is an Inductee of the Haitian Roundtable’s 1804 List of Haitian American Changemakers (2014) for his groundbreaking accomplishments in dance. Jean Appolon has been endorsed by E. Denise Simmons, Mayor of the City of Cambridge, for his positive contributions to the Cambridge community. Jean Appolon is a member of The International Association of Blacks in Dance and The Boston Dance Alliance.